It wasnt just a weekend in England....it was a weekend ALL over England. Landed at London City which is fantastic if you want to be in the city. Instead, DLR and tube to Euston to get a train to Birmingham International and then the 30min drive to the in-laws and Jack. The next day (Friday), back to International to pick up a rental and drive down to Midhurst and a wedding on Saturday at Cowdray ruins. Sunday it was up super early to drive to our newest niece's Christening...to which Lucy and I are Godparents. This was outside Tamworth. 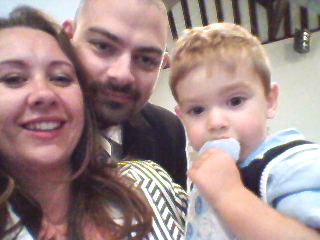 After the Christening....headed back to Four Oaks and then to The Lodge for a wonderful curry. This morning, up early...rental back to International. Train to London Euston. Tube & DLR to LCY..flight back to Zurich. I'm tired but wanted to show off the happy family in the picture on this post. not sure if we ever posted our wedding photos properly on the internet for folks to mock, gawk or whatever.... if not, here you go.